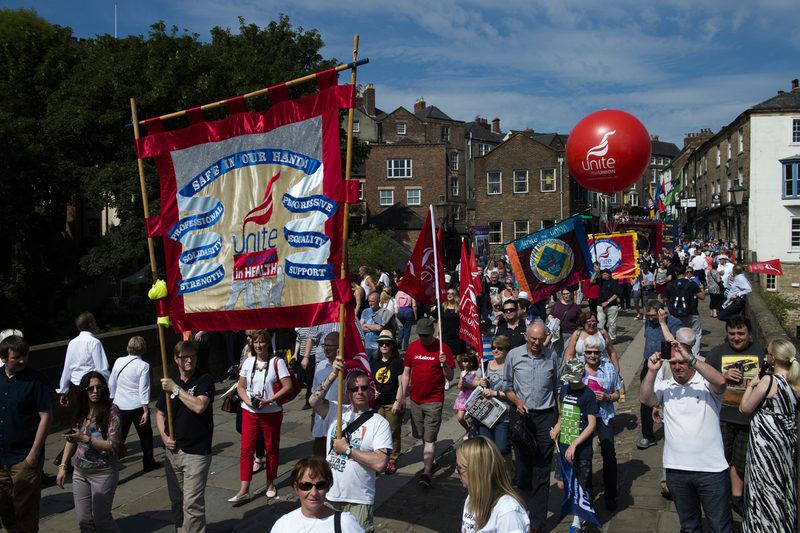 The Welfare Charter will be formally launched at the TUC congress next Monday. People are entitled to decent, stable and secure jobs that provide regular, guaranteed hours that allows them to also meet any caring responsibilities; not zero hours contracts in precarious jobs. We need a National Living Wage that people can live on, not just survive on, that applies to all. Forcing people to work for free on pain of losing benefits is simply providing free labour to organisations that should be paying workers proper wages. Everyone should have access to an advocate to help them navigate the social security system and appeal adverse decisions. A Claimants Ombudsman should be appointed to arbitrate on unresolved complaints, to ensure claimants are treated with respect and dignity. 6. 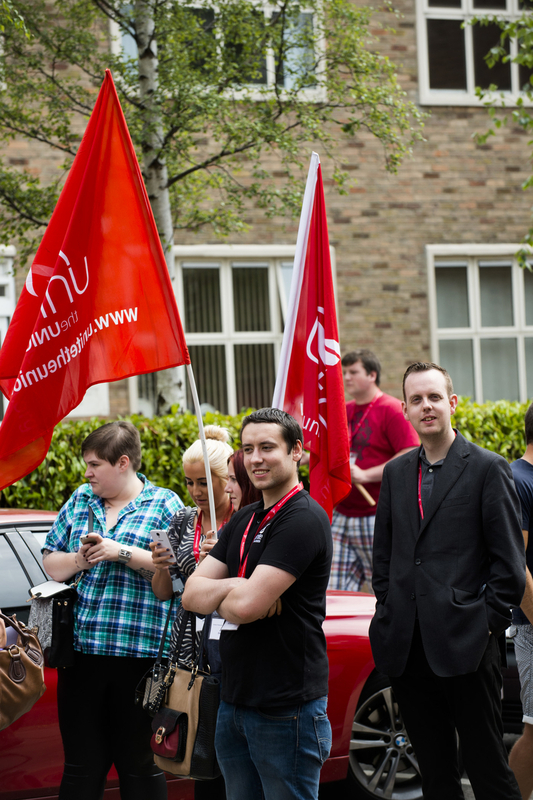 Equality in the labour market and workplace; equality in access to benefits. 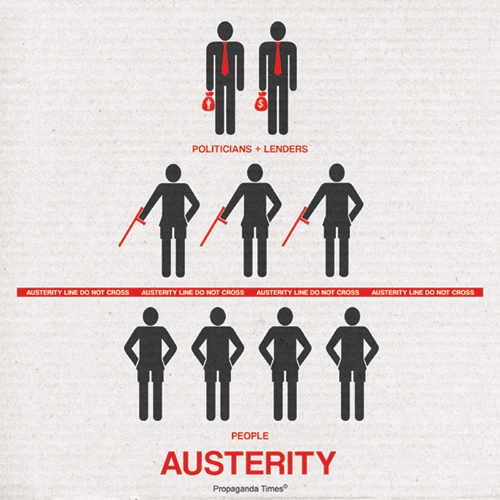 We need a labour market where structural inequalities are overturned and a benefit system that is accessible to people. 7. 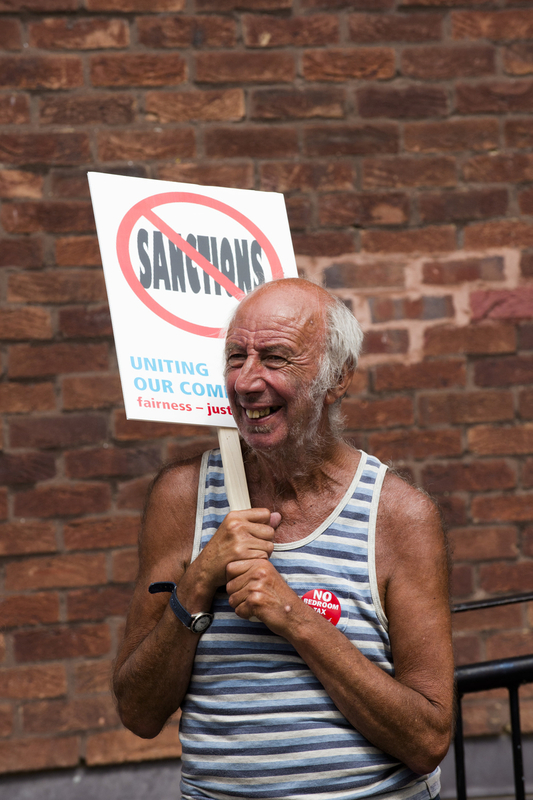 An end to the sanctions regime and current Work Capability Assessment – full maintenance for the unemployed and underemployed. 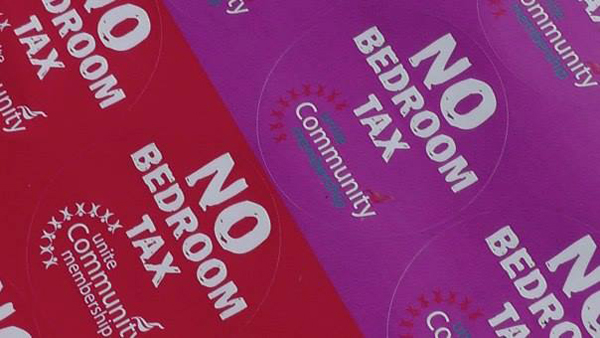 We need a non-means tested, non-discriminatory benefit payable to all, with housing costs met. This must be allied with the wide provision of low cost housing. There must be a supportive and independent careers and job-broking service, not linked to conditionality or benefits, offering face to face advice. The United Kingdom is one of the richest nations on earth, yet over 1 million people use foodbanks, more than a quarter of children live in poverty and 5.5 million adults go without one or more basic clothing necessities, like a warm, waterproof coat. We can end poverty in this country. 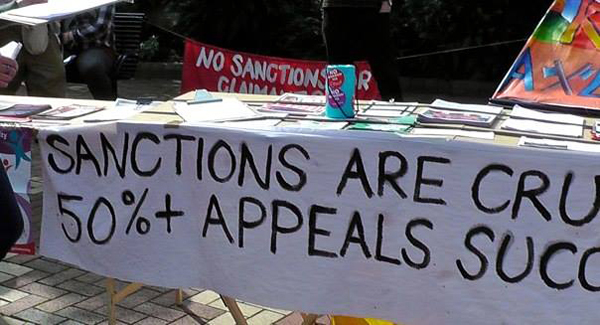 There is no place for a system that sees pushing people into poverty, the threat of hunger and eviction as a legitimate punishment for not being in work. We need a social security system that enables everyone to have a safe, warm home, good food, proper clothing and being able to participate in society. 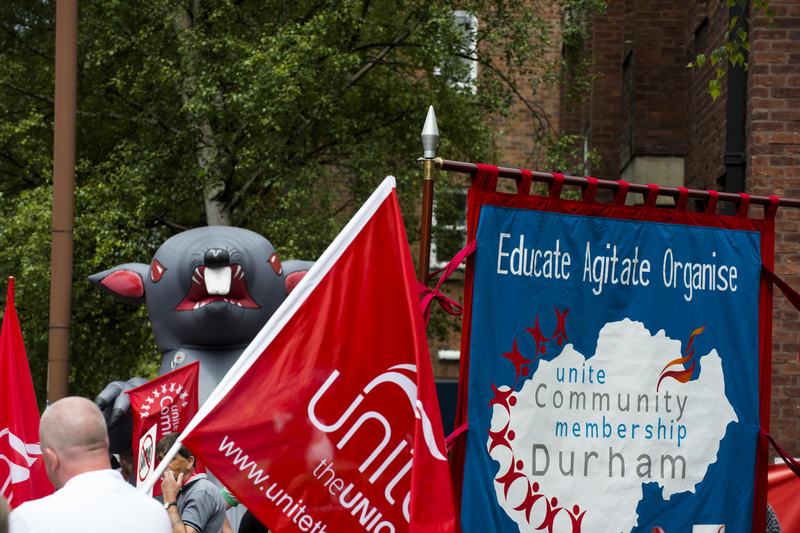 The Derbyshire Unemployed Workers’ Centre (DUWC) has published its Annual Report for 2014. 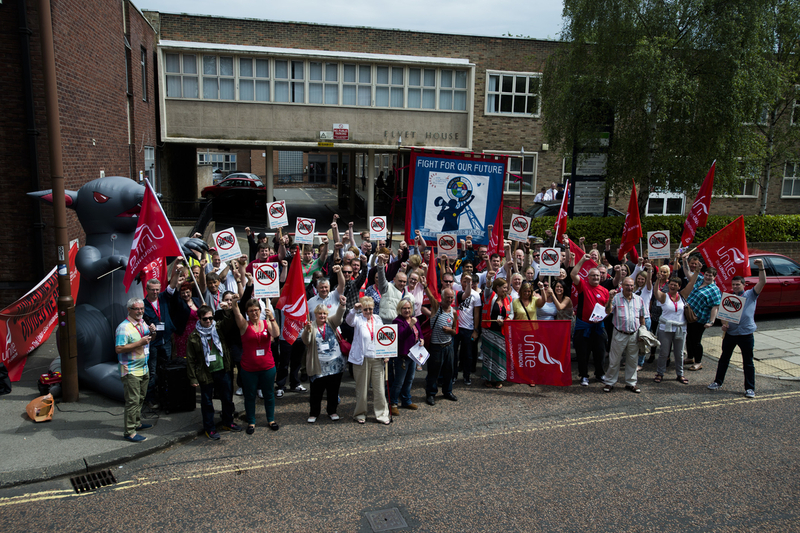 Established in 1983, the Derbyshire Unemployed Workers’ Centres are part of a larger network of TUC Unemployed Workers’ Centres. 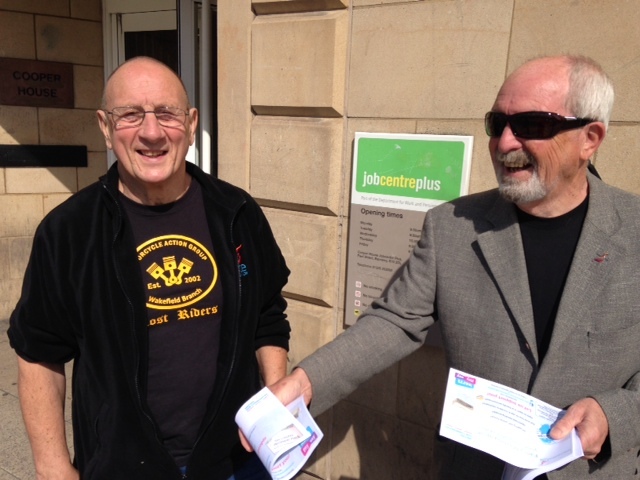 They aim to relieve poverty amongst unemployed people and those in receipt of benefits and credits as well as other disadvantaged people in Derbyshire. 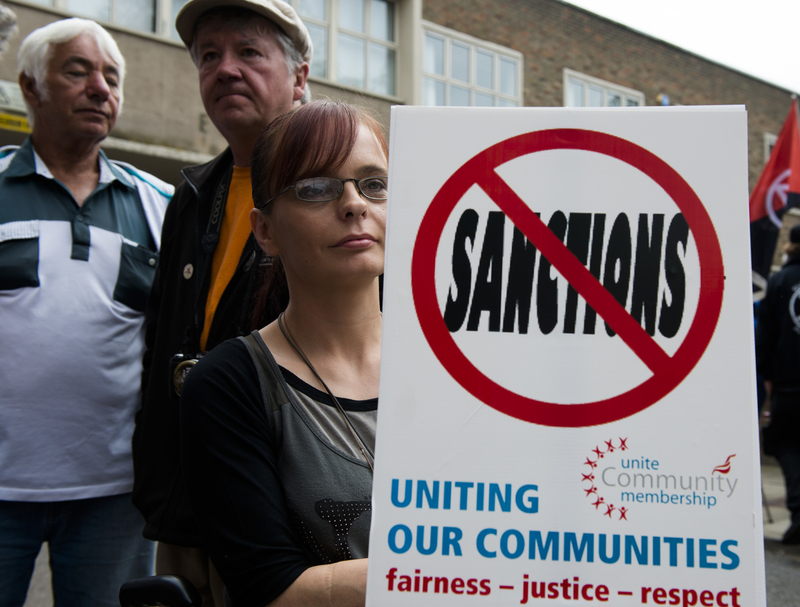 A short film on benefit sanctions. 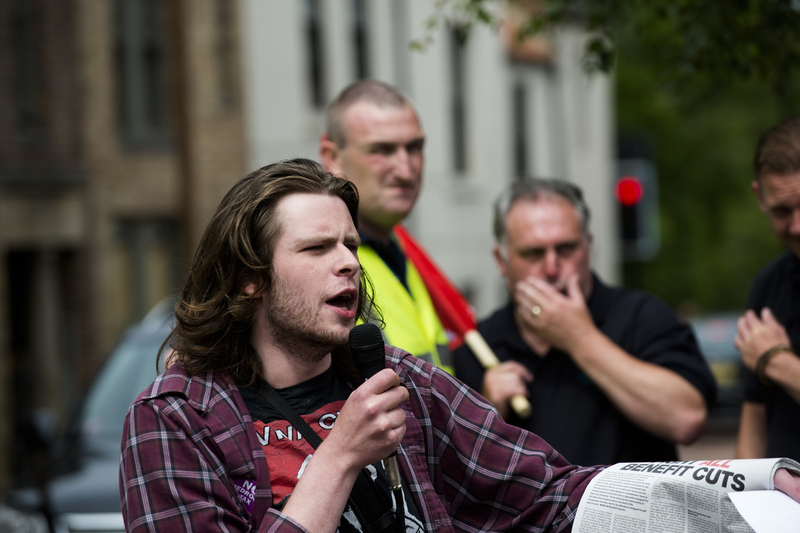 Trade Unionists, claimants and Unite Community activists gathered On Thursday 11 September in Sheffield, Huddersfield and Leeds to protest against the cruel and unnecessary Welfare Reforms. 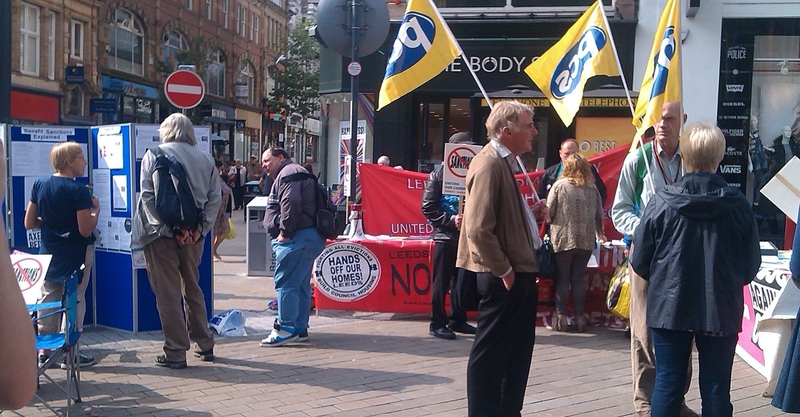 The activists held rallies and Information stalls and picketed one company in Sheffield over their continued use of workfare. The Yorkshire Post covered the event in Leeds (here). 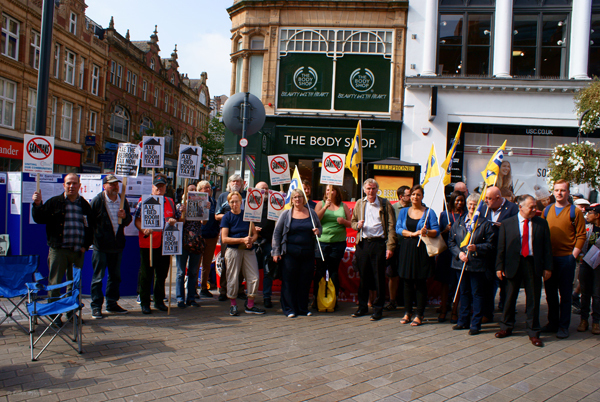 “A big thanks to everyone who came along to Briggate today to show their disgust at these cruel attacks on claimants and people with long-term illness and disability. 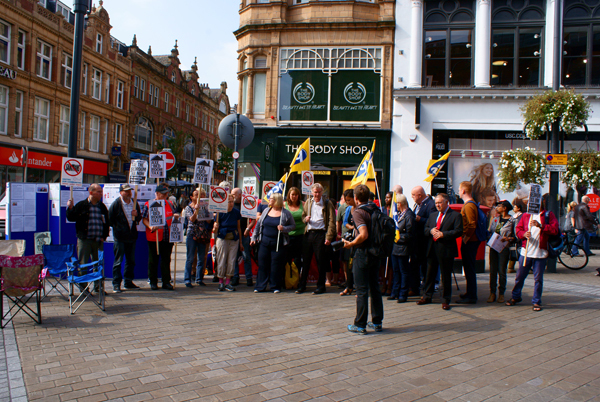 Members of the public were sympathetic, and we got a fair bit of media coverage – even if it wasn’t all accurate! 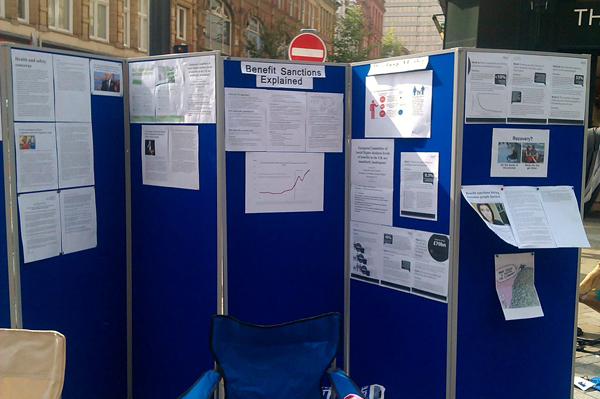 Our new display boards attracted a fair bit of attention, so hopefully some of the passers-by will have learned a thing or two about what it’s really like to be on benefits and to be constantly threatened with having those benefits cut or removed. 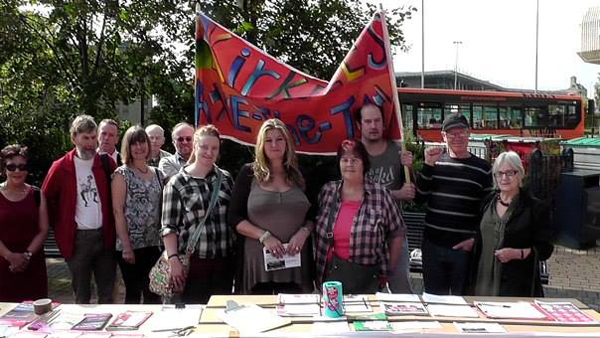 The Huddersfield Group are going from strength to strength and will be holding an activist training day on 30th of September email Claire Mawson to book a place. 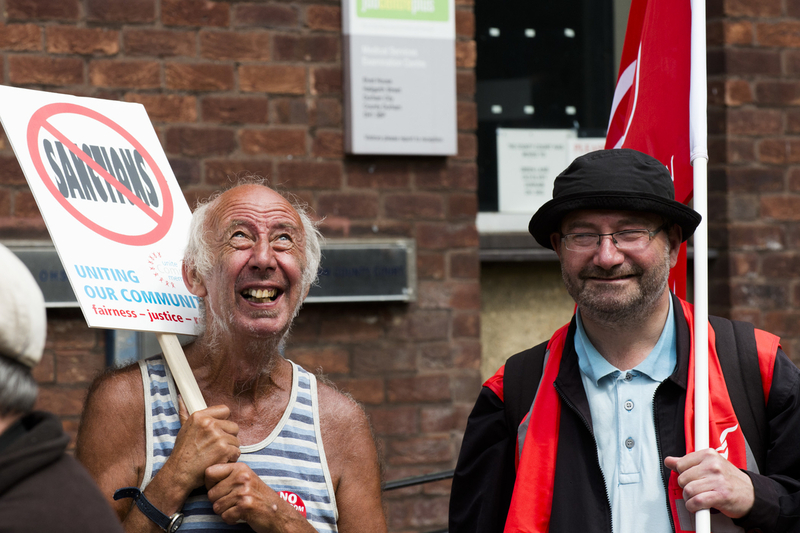 ‘SH’ on his experience of how Jobcentres are forcing claimants in to accepting zero hour contracts. As my wait had exceeded the usual 15 minutes, which normally consists of a cursory glance towards my painstaking 26 step job search and a “sign here please”, I knew it was my turn to see ‘The Enforcer’. 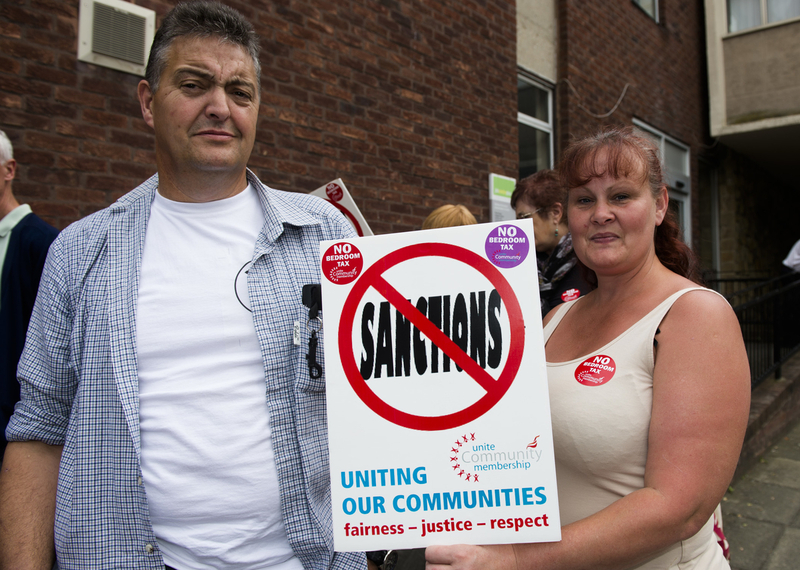 Every now and then I’ve noticed I would be signed by a member of staff whom I didn’t recognise, and subsequently realised this was a roughing up process to make clear that I was only one wrong step away from a three month benefits sanction. On this particular occasion, I presented my job search as usual, and welcomed any questions. However, it was immediately clear that this member of staff had taken zero effort to look in to me or my circumstances and thus proceeded to quiz me on the credibility of newspapers and websites which I use to find job vacancies. I have experienced this before however, so answered the questions politely and in full. The next step however, left me aghast. 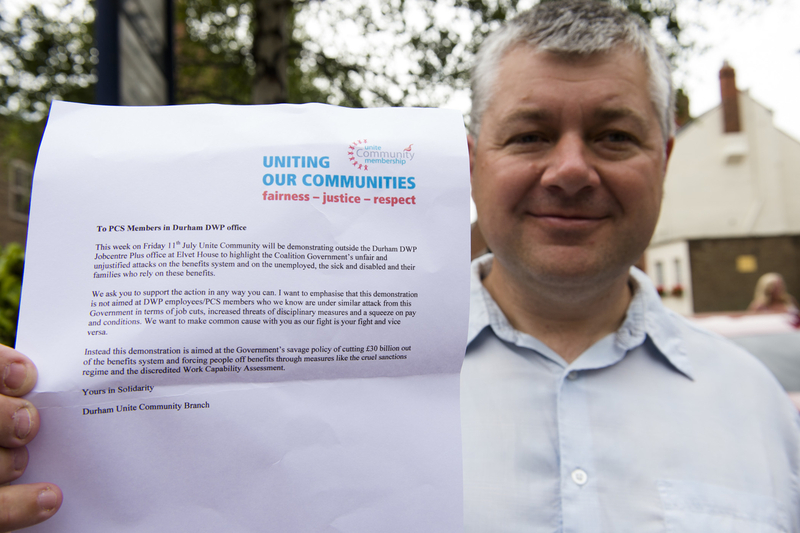 I was initially given a thorough dressing down on how I couldn’t hope to work in the public sector and “preach about benefits” when I had been claiming JSA for 3 years (I have been claiming JSA since graduating little over ONE year ago) and had “no life experience” so I should strongly consider looking at zero hour contract work as a way to gather it. 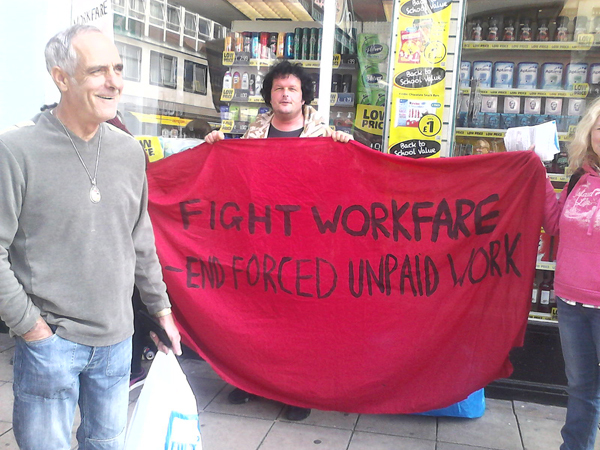 Now, I am, and always have been under the impression that the role of DWP Job Centres is to get those of us unfortunate to be seeking work back in to suitable and sustainable positions. Zero hour contracts offer no security to the employee and can surely, given their nature, not be seen as a sustainable form of employment. 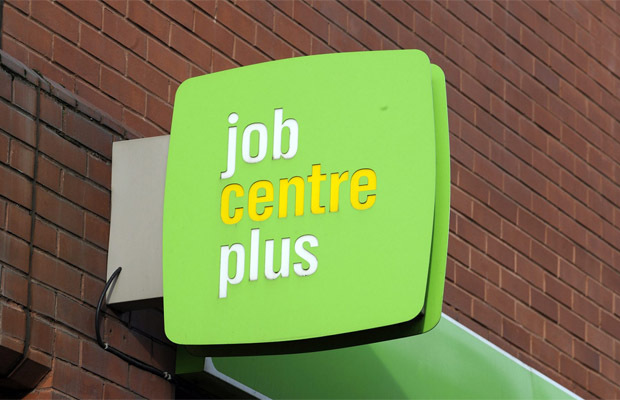 I was left shell shocked that I was being actively encouraged to pursue such an insecure form of employment and on doing a little research, I found it may be worrying common practise in job centres across the country. 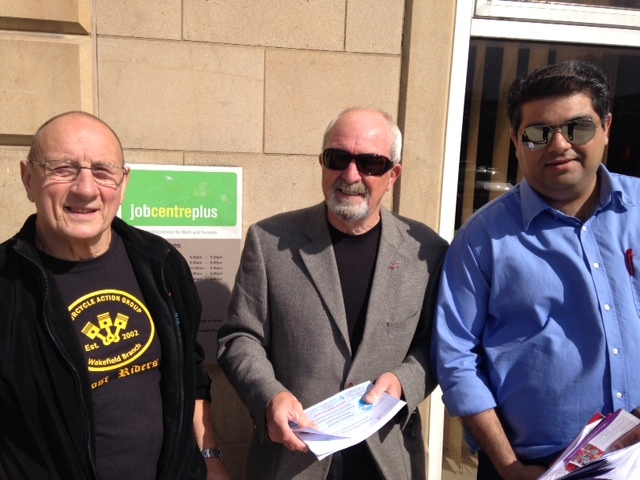 Unite Community members where out leafleting again today, this time outside the Barnsley Job Centre again, to deliver our letter to PCS Members in the Barnsley DWP office. 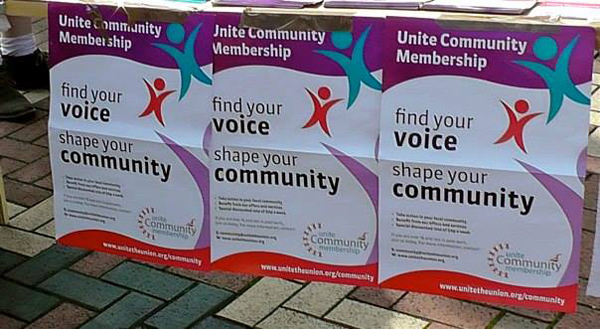 This week Unite Community will be holding an information stall outside the Barnsley DWP office to highlight the coalition government’s unfair and unjustified attacks on the benefits system and on the unemployed, the sick and disabled and their families who rely on these benefits. 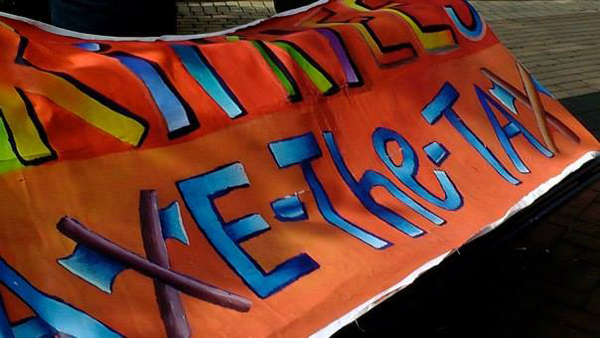 We ask you to support the action in any way you can. I want to emphasise that this stall is not aimed at DWP employees/PCS members, who we know are under similar attack from this Government in terms of redundancy threat and squeeze on pay and conditions. We want to make common cause with you as out fight is your fight and vice versa. 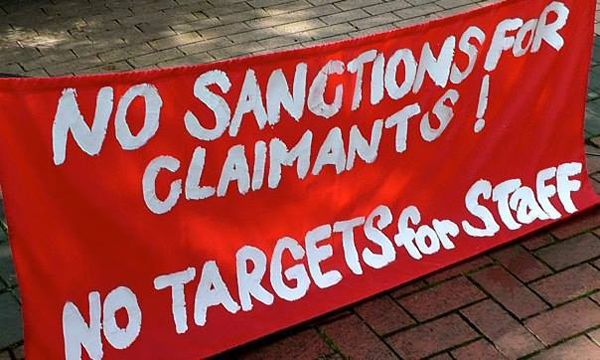 Instead this demonstration is aimed at the government’s savage policy of cutting £30 billion out of the benefits system and forcing people of benefits through measures like the cruel sanctions regime and the discredited Work Capability Assessment. 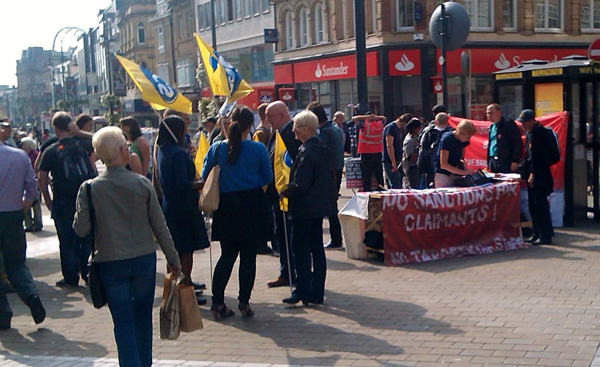 This has resulted in us setting up a meeting with the Barnsley PCS Branch. Leaflet here. Click on the images to see the slideshow.